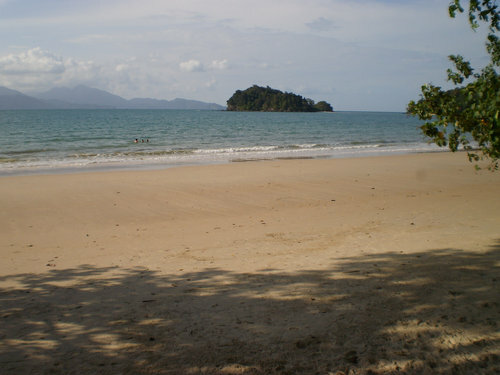 Datai area in Langkawi has been developed for a select exclusive section of tourists. If you want a vacation in a secluded hideaway and in a super luxurious resort spanning across a vast stretch of forested land on a hill slope, and offering private trolley cart rides to its various facilities including one of the prettiest private beaches, then Datai bay area would be ideal. Datai area is located at the north western end of the island and faces the northern coast where the Datai Bay & the Beach is located. There are couple of great luxury resorts here - The Datai and The Andaman, and that's about it. The guests at these resorts are mostly rich Europeans who come here to disconnect from rest of the world and immerse themselves in few days of lifestyle that very few can afford. And that includes living in suites with private swimming pools, dining in a classy restaurants set up in a rain forest, and lounging in the sun on exclusive Datai Beach with many personalized services. If you are not staying in one of these resorts, you are unlikely to come to this area often, unless of course you plan to explore all corners of the island like me. Taxis charge extra to come to this part of Langkawi as it is considered far by the island standards. While there are few attractions nearby like the Crocodile Farm, Temurun Waterfalls, Tengkorak Beach, Ibrahim Hussein Cultural Foundation and such, one of the greatest attractions here is the rain forest on the mountain slope that stretches all the way down to the coast line. You can enter the forest from one of the side roads or trails that leads down from the main road Jalan Datai. You will find many different kinds of birds and small animals here. But be careful that you do not encroach into the private areas of the resorts. Datai Bay Golf Club which is nestled between the bay and the Mat Cincang mountain, is considered one of the top 10 golf courses in the whole of Malaysia. Most other activities like Spa, water sports etc are confined within the resorts. There are no shopping areas nearby. Hotels in Datai area: Only two large super luxury resorts on the water front. Attractions in Datai area: There are few in the area including crocodile farm, waterfalls and couple of great beaches. Activities in Datai area: Water sport and beach activities organized by the hotels. There is also a Golf Club here. Restaurants in Datai area: Essentially resort restaurants. There is one roadside open air restaurant as well. Essentially the Beach Bars in the resorts.